We are delighted to bring you this new excerpt from Pico Iyer. 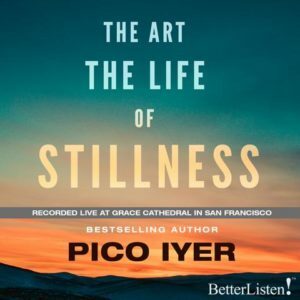 The Art The Life of Stillness considers the unexpected adventure of staying put and reveals a counterintuitive truth: The more ways we have to connect, the more we seem desperate to unplug. “Churches are not buildings. Churches are people and gatherings of people. But a cathedral is a building and this great space is actually named for that great big red wood chair far up at the front up there which is called a Cathedra and a Cathedra is the Apostles chair for teaching the people. An early claim of the church was that our Apostles teach all who come out in the open where all can learn and all can hear. So these gatherings in Grace Cathedral where we get to learn, where we get to reflect, where we have great teachers like Pico with us are exactly the purpose for being in Grace Cathedral.